I met this young woman at a local trunk show and fell in love with her designs. So much so that I bought an amazing necklace for a friend. Ms. Audrey is very unique in her designs and can basically customize anything. I immediately thought should would have great ideas for wedding jewelry. Her style is a bit more contemporary and funky then the usual 'crystal drop' necklace but for the right bride this endeavor could be really amazing. 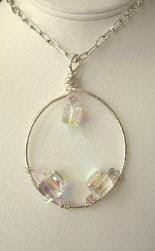 You could also have some jewelry made as your bridesmaids gifts too. Check out her website for other ideas on her designs and some cool fashion shows she has been featured in. 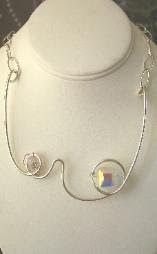 Audrey Thacker’s collection of jewelry is an eclectic mix of Natural Stones and Minerals, combined with, Swarovski Crystal and Sterling Silver designed to bring out the natural beauty of all women. 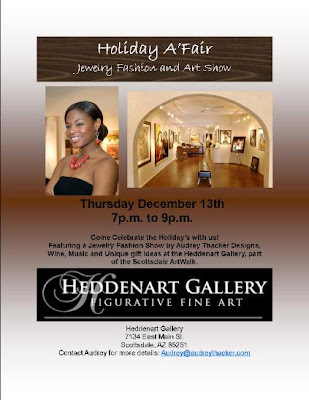 She will be featured at this Jewelry Fashion and Art Show tonight. Go check her out and really get a good look at her amazing talents. Not to mention she is a dynamic woman artist and entrepreneur. Great to support her locally.